Beautiful Bolivia (and why we’re sad we have to leave) | Blog the world!!! And Bolivia’s hasn’t only stood out to us for its landscapes, it’s a land full of beautiful contradictions and obscurities that leave you baffled… but smiling. The people for starters are some of the most positive and optimistic people I’ve ever met. It’s well known around South America, and indeed the world, that Bolivia is by no means a rich country. In fact it’s the poorest country in the whole of the continent. But you’d never guess it to meet the locals. Many Bolivians seem to feel a kindred spirit towards Peruvians as they think the two countries are around the same place on the poverty scale. To us, having just left Peru, it doesn’t really seem to come close. But the Bolivian attitude makes them seem richer than they are. Everyone is happy with what they have. No, it’s more than that – they’re grateful. The ladies carry around their children in woven shoals over their backs, people greet each other as they pass and everyone is family orientated and proud of it. That night we slept in a room with no locks in a hostel without heating on an Andean mountain in the cold. When I asked about a key the guesthouse owner looked at me for a while as if she couldn’t for the life of her work out why I would want one. And we left it at that, because we’d realised by this point in Bolivia that the people here are laid back about most things. And keys, locks and heating just must be some of those things. We honestly thought the tour couldn’t get any better after the salt flats. I mean, it had been named after them after all. 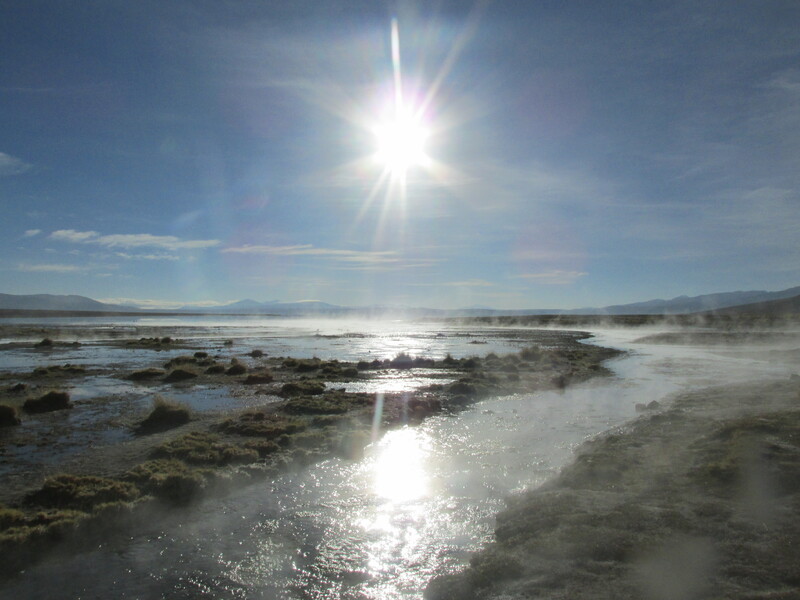 Day two proved us wrong though as we were continuously confronted with the natural wonders Bolivia has to offer. Who’d ever heard of a red lake? Well, now us. And we’ve seen one. To this day I can’t explain why it’s red… although the lake is home to thousands of flamingos, so maybe it’s just their pink dye coming off?! Our driver also took us to a slightly easier to explain but non less beautiful blue lake and a lake that used to be green but the week before we turned up had reverted to being blue again. The lake had turned green centuries ago when the Inca’s had dumped all their gold at the bottom of it in order to keep it from the Spanish. But the week before we turned up (of all weeks) there had been seismic movement in the tectonic plates below the lake and it’s believed the gold has moved/dropped to below the earths crust. It may not be green anymore but it makes for a damn good story! All of these lakes were surrounded by high mountains (many reflected in the water) or vast desert landscapes. It was natural wonder at its most wonderful. The kind hearted nature of the Bolivians wears off for only one thing. Chileans. Whereas the people of Bolivia have a fondness for Peruvians, they also have resentment for Chile, and the Chileans. Actually, come to think of it, so do Peruvians… It’s easy to see why though – two countries living well under the poverty line joined to the richest country in South America, it’s got to grate. Bolivians aren’t keen on Chileans for more reasons than just this though… Chile stole their beach. Bolivia used to have a lovely coast just past the desert to the west, now they have Chile. It stood to reason then that on our last day of the tour we woke up both excited and nervous. Excited because we were going to see the hot springs, the geysers and the beginnings of the vast Atacama Desert. Nervous because that desert contained the boarder to Chile, and although we couldn’t wait to see what it was actually like, we’d spent the last month listening to people badmouth it. The boarder is just a small hut in the middle of the desert. You can cross illegally into Chile, no one will stop you. We did it in fact! But like I say, you’ll be in the middle of the desert. Odds are you’ll die. Before we reached the boarder we paddled in natural hot springs (just around the corner from where everyone else was dunking, it was actually quite romantic), embraced a lightning storm, watched snow, hail and sunshine from the car and made noise using our hands in the electrically charged air. Chile has a lot to live up to for us. Bolivia may not have a beach anymore, but it’s incredible what they do have. Rainforest, multi coloured lakes, huge flats of salt, Andean mountains, a desert, natural hot springs, every type of weather imaginable and most importantly, a nice, laid back, caring and friendly way of life. 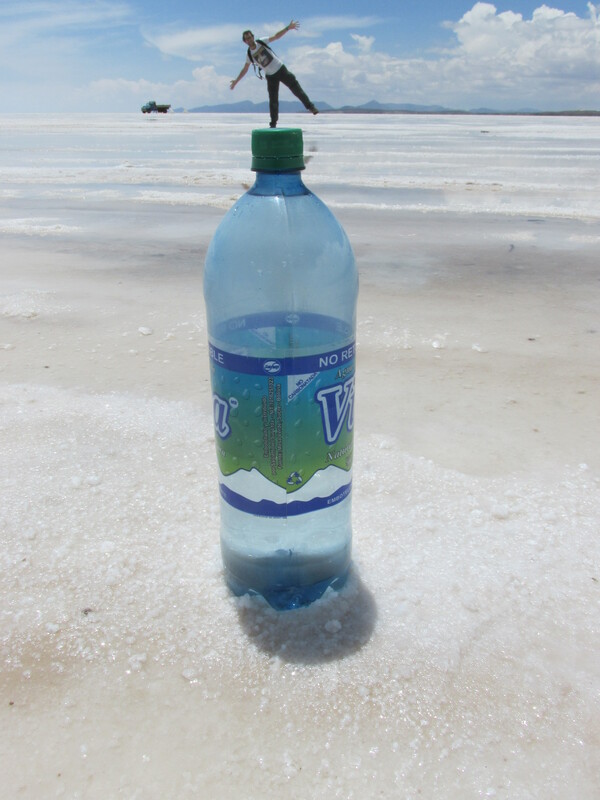 I’d love to recommend the tour company we booked the Salar de Uyuni tour with but I can’t. The morning we left, our tour company decided not to go and gave us to one of their friend’s tours instead. Now, the westerner in me wanted to complain, but this is Bolivia, and if there’s one thing we’ve learnt here it’s just to smile and go with the flow. And that’s something, that when I do go back to England, I hope to take back with me.